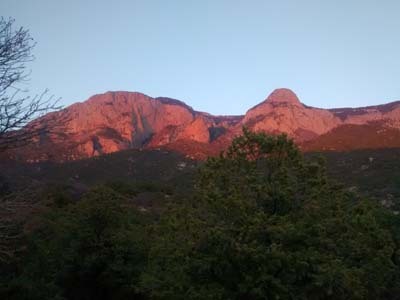 Albuquerque. It's not spelled at all like you'd think. Wish that was the only lesson we had in store last week. It seemed bad luck and poor decisions were the order of the day even before we got to the city. 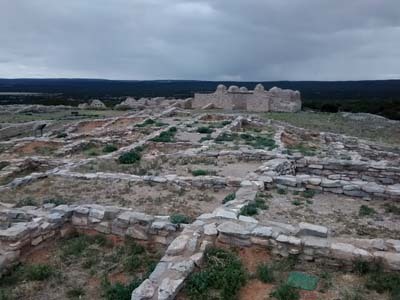 Our route to Albuquerque sent us north via the Salinas Pueblo Missions National Monument, which is divided between three locations; each protects the ruins of a pueblo village and the Spanish mission church associated with it. 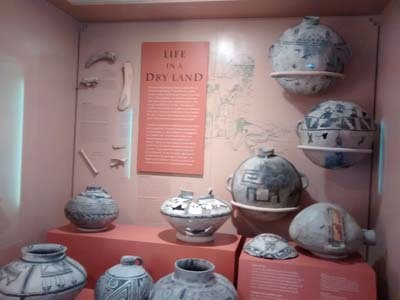 At the visitor center of the first ruins, we marveled at the display of pottery that had been unearthed there. 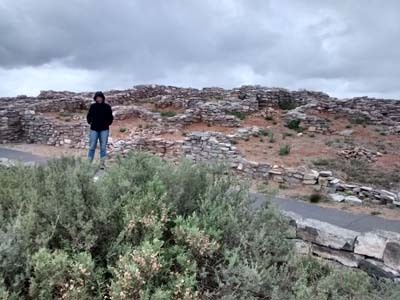 Living in a dry land with no water source, the puebloans might have been pleased with the weather this particular day; it was cold and raining! We pulled our parkas tight and soldiered on. 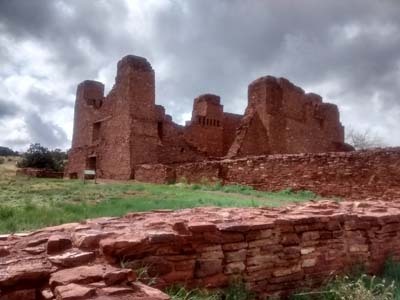 About 30 miles farther north, at the second mission, we waited twenty minutes in the parking lot for the rain to stop, which it did - for about an hour. We skipped the third site entirely and headed down a Santa Fe National Forest (dirt) road where we'd been told there was a free campground. After five miles we reached the little turnout with three old tables and a vault toilet. This was truly only a campground in name. Unfortunately, it was now raining even harder. The dirt road was rutted and already quite muddy. What were we thinking? We know better than to drive these roads when wet! Even more unfortunately, this was the weekend. There was one other vehicle parked here and we saw two women standing by a campfire. We greeted them, spoke briefly, and they seemed nice enough. But then a very inebriated man joined them. Soon we heard cursing and yelling and watched as he began to smash full beer bottles into the fire. This campground was not big enough for us to get away from or ignore this situation; we had to leave! What were we thinking? 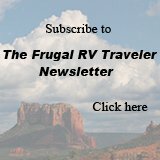 I tell RVers who write me with fears about remote boondocking that the risk of trouble increases the closer you are to large cities. 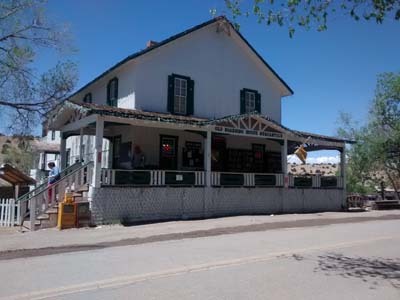 Here we were, only 30 miles from the largest city in the state -the city chosen (for good reason) as the setting for the TV series, Breaking Bad. We should have known better. We did, however, heed my other regular piece of advice: "If a place doesn't feel safe, leave." 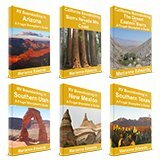 Needless to say, you won't find that free campsite in my Frugal Shunpiker's Guides! Driving the five muddy miles of Forest Road back to the highway, we realized we had about 40 lbs of mud caked into the wheel wells. We phoned the Boondockers Welcome host in Albuquerque who we had already made arrangements with for the following night. We were welcome to arrive a day earlier than planned. Yes, Thornyrrose saved our bacon! 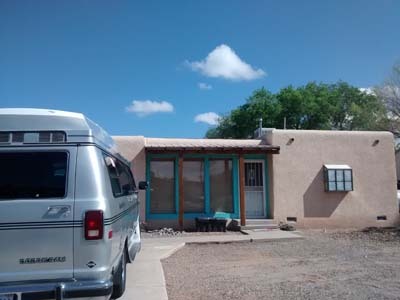 There are currently four Boondockers Welcome hosts in and around Albuquerque. 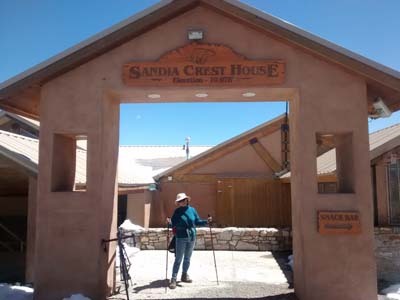 We had chosen this one for the central location as well as a second host, ASolarRV for the proximity to the Sandia Aerial Tramway and the La Luz trailhead. Both hosts were fabulous and their locations worked out beautifully for us. view from BDW host, ASolarRV's, home - wow! 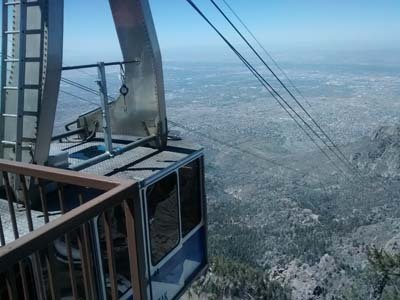 Taking the Sandia Mountain Aerial Tram, an engineering feat that boasts one of the longest spans in the world, had been on our bucket list for a long time. 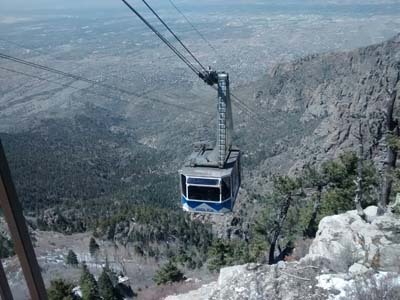 Foolishly, we had also thought we'd ride up on the tram, and hike the famous La Luz trail down from the mountain. That plan changed when we realized that the trailhead was at least four miles from the tram station where we'd be parked (for a total of twelve hiking miles). Even though it would be all downhill, we changed our plan. 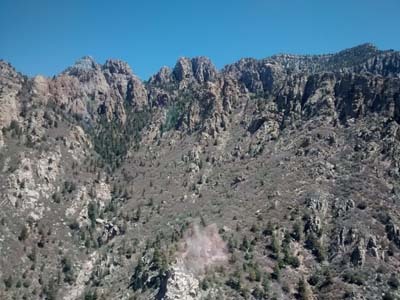 We would buy the return ticket for the tram and hike the crest trails system at the top instead. 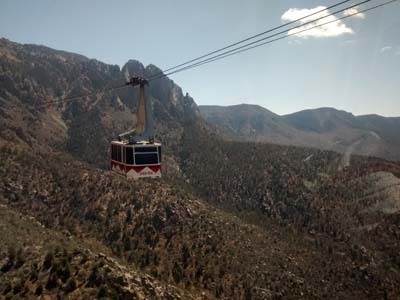 At $17.00 per person, the tram was a more-than-frugal expense (especially, since you can drive up to the same trails from the east side of the mountain) but we do allow for a couple of splurges - usually for one-of-a-kind experiences - on each trip. 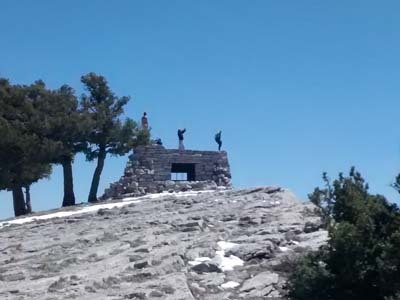 There's also a restaurant at the top but we resisted that temptation and packed our own lunch. 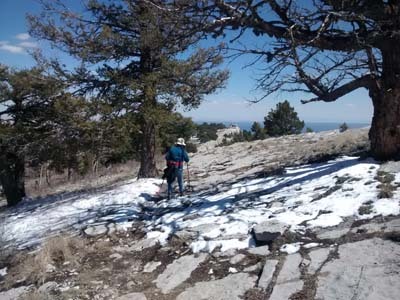 The trails at the top offer great views but, at this time of year, they were muddy with lots of snow in shady areas. In fact, it was easy to slip and fall, which I did (only a bruised knee). 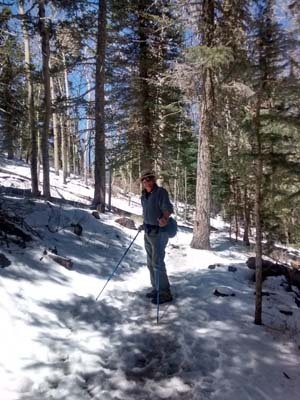 We now realized how difficult a 12-mile, downhill hike would have been under these conditions. 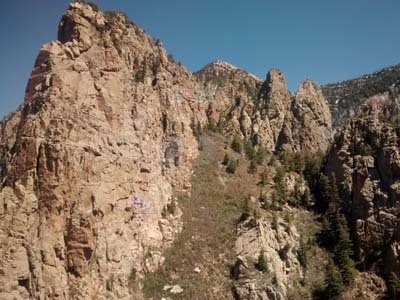 Later, on the return tram ride, the tram conductor told us that the La Luz Trail is only recommended as an uphill hike. Small granite rocks and pebbles make downhill hiking treacherous and dangerous. I guess we really should spend more than a few minutes on the Internet before choosing major hikes like that. What were we thinking? 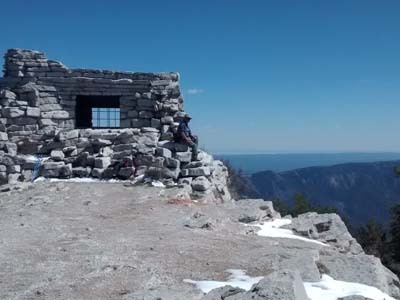 We did have wonderful views and hiked beyond the stone cabin that's the destination of many day-hikers to the highest point on the mountain. 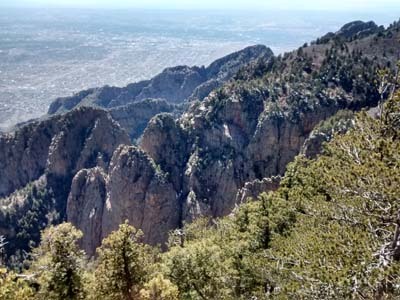 We were in Albuquerque for three days and enjoyed a couple of other trail hikes in the city. In fact, we came away with the impression that this city is a lot more health and fitness conscious than we imagined (after watching Breaking Bad). Even mid-day and mid-week, the trails were busy with cyclists, dog walkers, joggers and hikers. 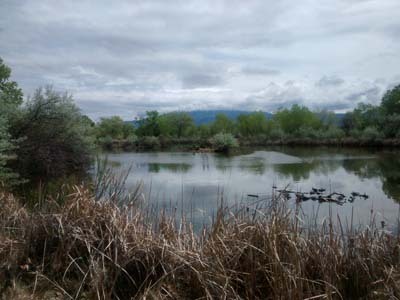 The Rio Grande Bosque Trail cuts through the city's core. 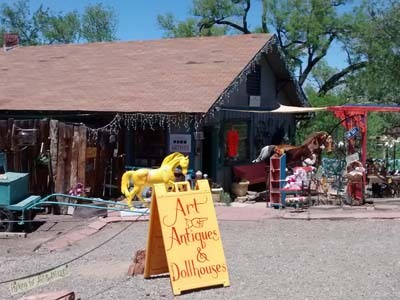 Now, on our way out of Albuquerque, we still had a couple of lessons waiting. 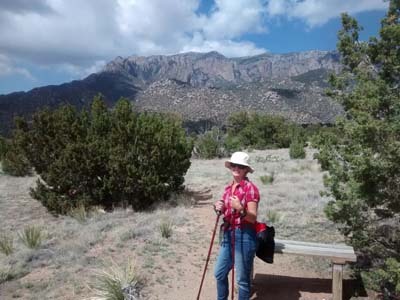 We drove a scenic byway north, The Turquoise Trail. 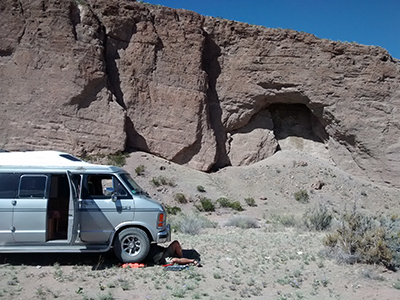 This perfect Shunpiker's Route took us through Madrid, a scenic, interesting, old, mining ghost town, now home to a hippy community of artists, unique galleries, shops, and restaurants. It was here that we first heard a strange sound from the engine compartment. Randy’s a genius. He disconnected belts to find out which one made the noise go away. This allowed him to diagnose the issue; he determined it was coming from the power steering pump and it was probably bearing-related. It did need to be dealt with so, since he was pretty sure what needed to be done, we found an Auto Zone store, ordered a replacement pump, and asked the clerk if he could recommend a good, local, small-shop mechanic to install it. We've asked this same question many times on our travels and it has always worked out fine. The clerk recommended his friend's shop: a Meineke franchise nearby. We drove there, asked the mechanic to verify that this, indeed, was the problem and asked if he could fit us into his schedule the following day. At no time did we ask about the hourly rate. What were we thinking? Especially since we deal with Meineke at home. We take our vehicles to them for a regular oil change but we know why their oil change prices are so cheap. It's because they provide a "free" checkup with every visit. Invariably, they find something wrong or about to go wrong - brakes, muffler, shocks, air filter, etc. Their free quote is always at least twice as expensive as it ends up costing us to have our regular mechanic do the work. Why? Meineke labor is not billed by the hour. Each type of repair has a standardized cost (by the book), no matter how long the job takes. 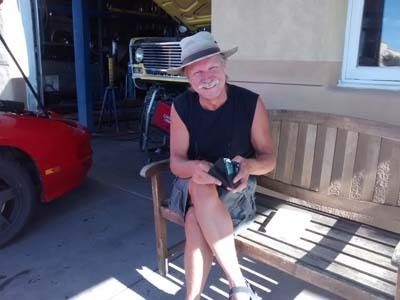 The part in hand, we arrived back at Meineke the next morning. We waited while they changed it out. It took an hour. The labor bill was over $200.00! We could easily have gone elsewhere since the van was quite drivable. We know from experience how Meineke works in Canada, yet we didn't ask for a quote. What were we thinking? Randy did protest and the bill was lowered by $20.00 but still, it was far more than we should have paid. The worst part was, we know better! Other times he does it like this (opening his wallet). As our trip leaves Albuquerque, we marvel at how much we learned this week. Really? No! It was all stuff we already knew! Obviously, we just needed a reminder to "slow down and think"!